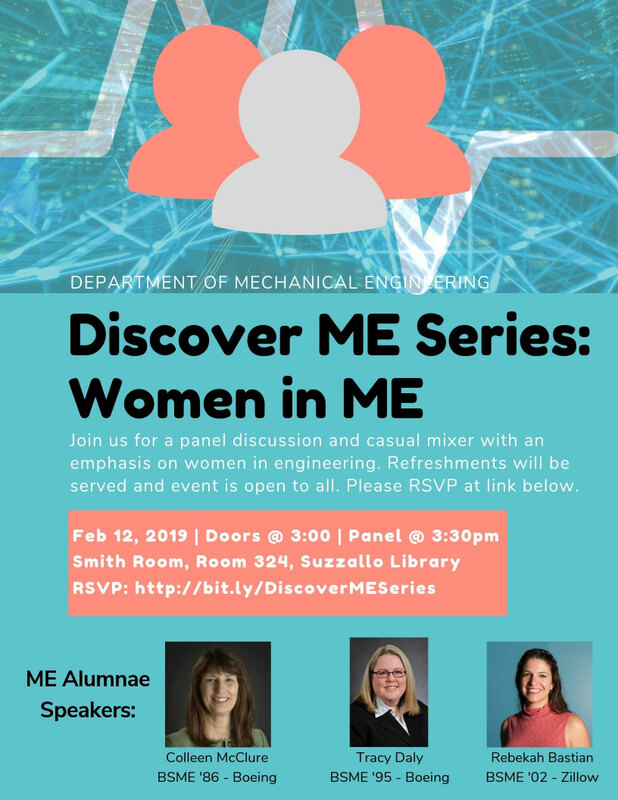 Thursday, Feb 28, 2019, 3 – 5 p.m.
You’re invited to attend the first in a new series of events put on by the Department of Mechanical Engineering — Discover ME. On February 12th, we’ve invited a panel of ME alumnae to speak on the topic of “Women in ME”. The panel Q&A will be followed by a mixer event with invited department faculty, lecturers, alumni and graduate students. Although some topics will be focused on exploration for our freshmen and sophomore students, we encourage ME junior and seniors to attend and contribute your experience to the conversation. Time: Doors open and refreshments @ 3:00 pm, Panel @ 3:30 pm, Mixer to follow @ 4:00 pm to 5:00 pm.